WASHINGTON — As if the Syrian civil war could not get worse, it seems that Iraq has more than enough on their hands. 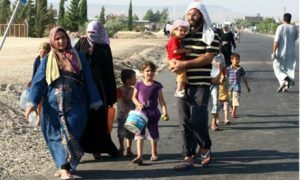 Reuters reports that the United Nations (UN) has said over 20,000 refugees from the Syrian civil war had crossed the unsecured border between Iraq and Syria. With the civil war escalating in Syria and causing destabilization in neighboring Lebanon, refugees are pouring by the thousands into other countries. Jordan is suffering from possible destabilization, due to their already-high numbers of semi-permanent Palestinian refugees from the past wars with Israel. Turkey acts as a smuggling haven along the Syria-Turkey border. Lebanon has seen a protester killed by Hezbollah, a Lebanese-based and Iranian-backed terrorist group, in addition to car bombings in the capital city of Beirut. The spillover effect is another threat to Lebanon as militias are beginning to escalate violence. Iraq is facing a potential civil war between its Muslim factions of Sunni and Shi’a. Car bombings and al-Qaeda attacks have claimed over 4,000 lives since the start of the year. Now, with an influx of Syrian refugees, the situation looks more untenable by the minute.